Originally discovered on weibo, an alleged teaser for the OnePlus 5 was posted today by internet tipster slashleaks. 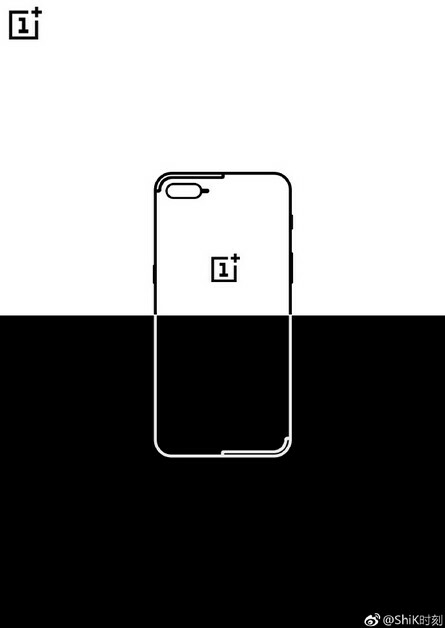 The image shows what is claimed to be the OnePlus 5's back cover. Unlike other recently disseminated images claiming to show the phone, this one has the dual cameras on the back positioned horizontally. Additionally, the placement of the camera module is off-center in the upper left corner of the rear, just under the upper antenna line. Another such line is found on the bottom right of the rear. A lozenge shaped flash unit appears adjacent to the camera module, and the OnePlus logo shows up about two-fifth of the way down the handset's rear cover. Yesterday, we showed you pictures that are claimed to be camera samples from the OnePlus 5. One of the images was in black and white, hinting that one of the dual cameras will shoot in monochrome. This feature supposedly will allow the phone to produce sharper and clearer photographs. The OnePlus 5 is rumored to carry a 5.5-inch screen and will be powered by the Snapdragon 835 chipset. That means it will carry an octa-core CPU and the Adreno 540 GPU. A 3300mAh battery is said to be powering the device, which CEO and co-founder Pete Lau says will be the thinnest flagship device available. With no such verification of the teaser that accompanies this story, we suggest that you take it with a grain of salt. Wouldn't be surprised if this were a lie tbh.. They've leaked different designs to the point where nobody knows whats true or not. This could well be a triangular phone for all we care. Why is this design so popular lately? Vivo, oppo, Huawei, and Apple all have phones that follow this general form but I can't understand why. It's uninspired and boring. I hope this is a false leak. Its popular because of the iphone 7 plus, just like the vertical set-up on the iphone 8 will become popular and the "in thing" too. Btw, the set-up on the oneplus 5 looks nice as it certainly looks better than the rumored center placement imo and i just hope its metal tbh, never liked glass on phones tbh. And it looked nothing like this. It was flush and hidden underneath a bar of glass, while this is just the two sensors surrounded by a small hump. We can sit and deny it all we want, but it's clear that all these phones coming with this camera hump design were inspired by the iPhone 7 Plus. All good phone design these days is uninspired and boring. There's only so much you can do with a rectangle and keep it functional and minimal. The Chinese are still in awe with Apple design. All these copycat designs helped Oppo jump right on top of the Chinese smartphone market and I expect many other brands to follow suit for some time to come. Having said that, give it some time until they are more well known in the west. By then I'm sure they'd be forced to come up with their own unique designs. And Apple is still in awe with Samsung's screen designs. Lol silly isheep. They aren't in awe of Apple's design. Their bottom line is the most dollar for the least amount of work. And Apple is the king of that. Not to mention it's always been when in doubt, do what the market leader is doing. That has never changed and that applies to all products and not just mobile. The sad thing is thanks to you sheep, Apple has been the mobile market leader for so long that this becomes blurred into everyone is copying Apple when it should still be everyone is following the market leader. Because all Chinese companies copy Apple. ZTE surprisingly is one that has not copied Apple that much. Axon 7 is like HTC M8/M7. iPhone 7 Plus, that's why. Chinese OEMs will either copy Apple or Samsung, only very few of them that are original. And that goes with every manufacturer in China, take a look at their cars for example and you'll see that it's almost the norm for them to copy other brands. I like the monochrome idea, but place them vertical in the center of the phone. Don't do the iPhone layout. Well pretty soon, vertical cameras the "iPhone layout", so the OnePlus 5 is going to look iPhone-esque either way. Those antenna lines look really weird to me. Only having them in the corners looks weirdly asymmetrical. I know they don't want the phone to look too much like the iPhone 7 Plus, but I still think the antenna lines would look better if they went ll the way across. Wow Pooyath , absolutely amazing observational skills. None of us could really figure that out. Sharp !! Sorry but this looks like the iPhone 7 Plus. Seriously though, that's probably just a OnePlus case for the iPhone 7+. They already have cases for other iDevices: https://oneplus.net/sandstone-case Edit: Seriously, this was a reply to my post #21. LOL, 3,300mAH. Good luck getting a full day with a lot of screen time, without resorting to constant recharging, or using battery savers & dimming the screen. The galaxy S8 uses a 3,000mah battery with a 5.8" Qhd+ screen yet does okay and you expect a phone with 1080p screen on 3,300mah not to do well? Smh..